Halloween has passed, temperatures are dropping, and you’ve had enough of constantly raking up leaves. It’s clear to everyone that summer is over (much to my dismay). As temperatures decline, so too does the amount of moisture in the air. As this happens, issues related to static electricity begin to increase. If you’ve ever walked across a carpeted surface, only to be shocked as soon as you touch a doorknob, you’re familiar with the effects of static electricity. In addition to painful shocks, static can contribute to a variety of problems within industrial processes. 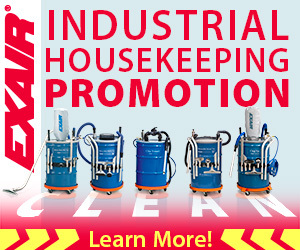 We’ve talked here on the EXAIR blog about several of these different applications. Some examples include: removing static on plastic packaging, stopping dust from clinging to product, or aiding in part removal in an injection molding application. These types of applications can certainly occur year-round, but the absence of humid conditions dramatically increases the potential for them to occur. 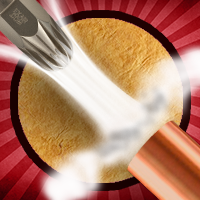 In this photo, a static charge present causes the plastic particles to cling to the end of a suction wand. They key to combating static electricity is first understanding how it it’s generated and how to test for it. 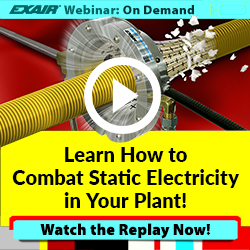 To help you gain some more knowledge about static electricity and the problems it can cause, EXAIR is hosting a FREE webinar this week. Within this webinar you’ll learn how to identify a static charge, the series of events that are causing the charge, as well as various ways to eliminate this nuisance. Brian Farno, EXAIR’s Application Engineering Manager, will be conducting the webinar at 2:00 ET on 11/7/18. Immediately following the presentation will also be a brief Q&A. If you can’t attend, don’t let that stop you from registering! A link to view a recorded version of the webinar will go out to all registered participants whether you’re able to attend live or not. Click here to register and view details on this upcoming webinar. Make sure you’re educated on the issues associated with static electricity before it’s too late! Warmer temperatures are quickly approaching, which may seem like a welcome change for personal reasons, but in a processing line, the increased temperatures can wreak havoc on sensitive components found in an electrical control panel. 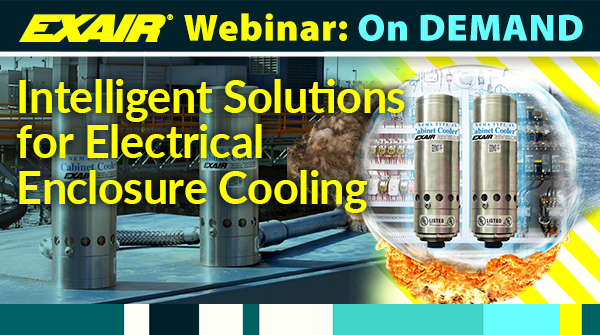 EXAIR Corporation will be hosting a FREE webinar titled “Intelligent Solutions for Electrical Enclosure Cooling” on May 23, 2018 at 2:00 PM EDT. By attending this interactive session, you will learn the difference between the 3 most common NEMA ratings for electrical control panels found in an industrial setting, NEMA Type 12, 4 and 4X. We’ll provide examples of traditional, yet unreliable, methods of cooling and the concerns associated with using these types of devices. Next we will explain how ignoring heat related issues can cause machines to shut down due to failed electrical components, resulting in lost production and increased maintenance costs, negatively affecting a company’s bottom line. In closing, we’ll show how using an engineered, compressed air operated solution can reduce downtime by providing a low cost, maintenance-free way to cool and purge control panels with no moving parts. On September 13th, 2016 at 2 PM EDT, EXAIR will be presenting a FREE webinar. During the short presentation, we will be covering the OSHA Standards for the safe use of compressed air when used for cleaning purposes. The first topic we will discuss will pertain to the OSHA Standard 29 CFR 1910.242 (b) limiting the outlet pressure of an open pipe, tube, air gun, nozzle, etc. to less than 30 PSIG. When dead ended against the skin, air pressure above 30 PSI, can introduce air flow into the body, otherwise known as an air embolism. An air embolism can be an extremely dangerous condition which can cause serious injury, such as a stroke or possibly death. Secondly, we will discuss the OSHA Standard 29 CFR 1910.95(a) for permissible noise exposure levels. In the Standard, OSHA has set exposure limits (in hours) for varying sound levels (dBA). When employees are subjected to sounds in excess of the limiting guidelines, some type of engineered controls should be used to reduce the sound level exposure. We will provide some useful statistics, as well as help you identify some common culprits found in many processes. Lastly, we will show you how EXAIR provides engineered solutions that address both dead end pressure and noise exposure levels. All of EXAIR‘s blowoff devices feature some type of relief so if the exhaust airflow were somehow blocked or pressed against the skin, there is always a safe path for the air to exit, so the discharge pressure never exceeds 30 PSI. In addition, we will explain how our products reduce wind shear, ultimately lowering the sound level, save energy and help you gain OSHA compliance to avoid costly fines. If you’d like to discuss a particular application and/or product selection, give me a call. Thanks for watching.